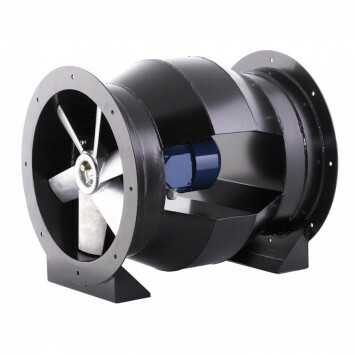 Range of bifurcated axial flow fans with motor isolated from the air stream making this range suitable for continuous operation up to 150ºC and a short time up to 150ºC and 200ºC for temporary running. The casings are manufactured from high grade rolled sheet steel protected against corrosion by black epoxy paint finish. All models incorporate one piece die-cast aluminium impellers. Available, depending upon the model, with singlephase or three phase motors in 2, 4 or 6 poles. All motors are direct drive, IP55, class F insulation. Casing manufactured from stainless sheet steel or formed from rolled sheet steel with a corrosion resistant hot dipped galvanized finish. Motor with PTC thermal protector.